Dalmatians are bright, active dogs originally bred to accompany the Coach and Horses on their long journeys across the Country, they would be expected to run or trot for many miles each day. With this breed purpose in mind a Dalmatian needs copious amounts of exercise, a quick trip around the block just wont do! At least an hour of exercise, once or preferably twice a day should be a minimum for an adult Dalmatian. Some of that time should be spent off the lead, free running. It is essential to have a good quality, strong collar or harness and lead, as even a young Dalmatian can be very strong. Getting your Dalmatian to come when called is also very important so regular reminders about re-call should form part of your daily ongoing training routine. Always ensure that when off the lead your Dalmatian is safe and cannot stray onto a road. Each day involve your dog in play, take a ball or toys and engage your Dalmatian in brain work, try playing hide and seek and vary the places you walk your dogs. Walk them in woodland, beaches, parkland and maybe try some town or city strolling. This will add variety to your dog’s routine. Dalmatians make great companions for Joggers and cyclists, they have a natural stamina to keep up a steady pace for many hours. 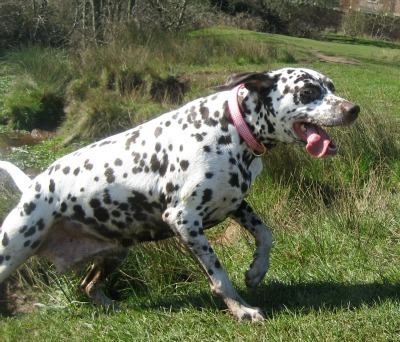 Lots of Dalmatian owners get involved with competitive cross country running or CaniX . Dalmatians due again to their history are said to have a natural affinity with horses and many of our Dalmatian enthusiasts will ride with their dogs. The British Carriage Dog Society ride their Dalmatians with carriages and hold several events around the UK each year. 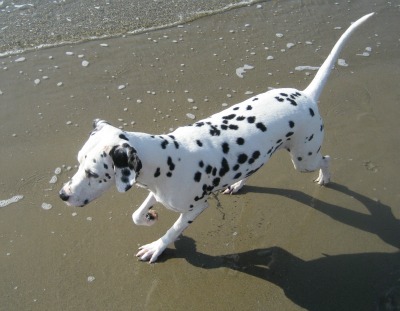 Without sufficient exercise Dalmatians will chew, dig and invent their own creative ways to burn off their energy. Many of the dogs we re-home in Welfare have problems directly due to their lack of exercise. Dalmatians when walked everyday, are a joy to have in your home. Whilst people are attracted to the Dalmatian’s many qualities the commitment required in owning a Dalmatian should never be underestimated. Do you have one to two hours each day, every day to exercise your dog? 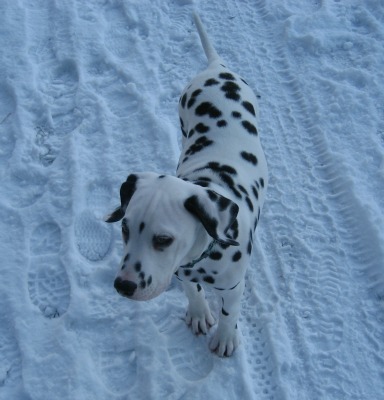 Your Dalmatian will live to be 12-15 years old and senior Dalmatians enjoy long walks until very late in their lives. They will need this exercise in sun, rain, snow and sleet. Time outdoors is part of the joy of dog ownership and it will do wonders for the health of your Dog, you and your family.